Please join us for a delightful afternoon of two concertos: one for oboe and the other for TWO BASSOONS (remember two bassoons are FOUR TIMES AS FUNNY!). The first piece is another NCO premier by oboist composer, Dan Schwartz. Dan is a professor of Oboe at the University of Oklahoma and a graduate of Vanderbilt University's Blair School of Music. Dan explains, "'The Bull, The Philosopher and the Harlequin', my concerto for oboe string orchestra, is directing inspired by some of the people I love the most--my nieces and nephews. Writing this piece, I hoped to capture their incredible and incredibly different personalities, drawing out uniquely colors for each movement. I am beyond excited to be world-premiering this work with the Nashville Concerto Orchestra. Having lived my college years in Nashville, this truly feels like a returning home, and I couldn't think of a more appropriate place to premiere this very personal work!" The second piece features Julia Harguindey, Dawn Hartley, and Gil Perel of the Nashville Symphony playing a classical double bassoon concerto for two bassoons by Czech composer, Jan Křtitel Vaňhal. 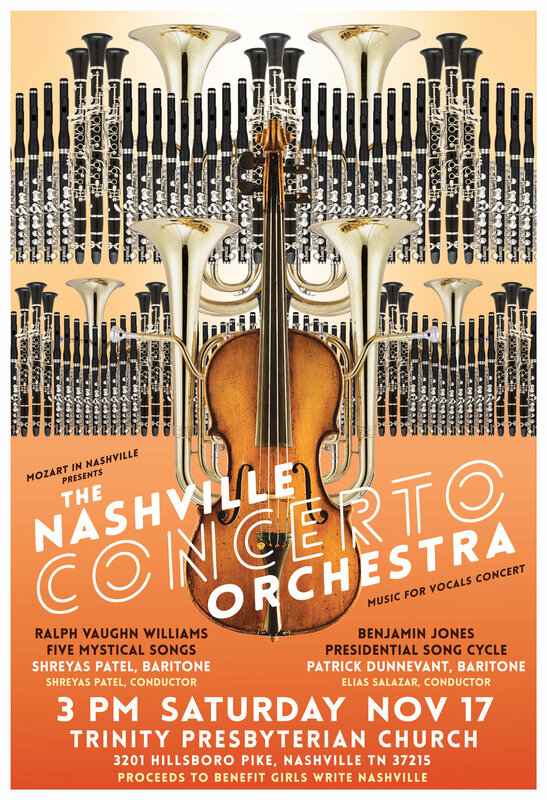 The Nashville Concerto Orchestra prides itself on being a playground for musicians to experience their joy in music. In true NCO fashion, this concerto will be performed by three bassoons and will be tag teaming like we used to see in old time wrestling on TV! A love offering will be accepted to benefit The Oasis Center of Nashville, a nationally-recognized organization on a mission to help young people in Middle Tennessee move into a happy, healthy, and productive adulthood. Cellists Kaitlyn Raitz and Josh Dent will present a piece by Giovanni Sollima. This Italian composer was a cellist influenced by a wide array of genres from baroque to minimalism, jazz to rock, and ethnic traditions from the Mediterranean to film and theatre music. His music is regarded as ‘post-Minimalist’ and is perhaps best exemplified by “Violoncelles, vibrez!”. Originally written for two cellos and orchestra, the piece was later arranged for cello octet in honor of the tenth anniversary of the death of the great Milanese teacher Antonio Janigro. Described by The Guardian as featuring ‘breathtaking sonorities ambiguities and audacities’ and by The Times as a ‘real crowd tickler’, this delightful and dramatic piece perfectly shows off the ensemble’s virtuosity in shaping and exploiting their unique sound. William Wiggins, who played timpani in the Nashville Symphony for almost 50 years is performing an 18th century century concerto for six timpani and orchestra composed by Georg (Jiri) Druschetzky. A Czech/Bohemian oboist/timpanist/composer, Druschetzky worked as a military musician in various posts in Austria and Hungary in the late 18th early 19th centuries. The Concerto for Six Timpani and Orchestra was written ca. 1790. For this performance Professor Wiggins will be using instruments similar to ones which the composer and his contemporaries would recognize. Unlike modern pedal timpani, these instruments are simple copper bowls tuned by means of T-handled screws around the circumference of the bowl. The pitch of each drum is fixed for the duration of the piece, comprising a C major scale from G to E. The drum heads are natural skins as opposed to the synthetic film of today. The concert is free. Money collected in the love offering will be donated to help refugee children in Metro Public Schools. Featuring Glass Armonica player Dennis James. Proceeds to benefit The Little Pantry That Could. Proceeds to benefit Girls Write Nashville. Our first concert of the season will feature everyone's favorite stringed instrument! NCO will perform 3 pieces of music featuring the talented members of Nashville's cello community. Poster design by Dan Sommers. Bach & Gorecki co-presented with "Violins of Hope"
This two-part series is part of a city-wide dialogue on the arts and social justice, presented in conjunction with the Nashville Symphony and the Violins of Hope exhibit, commemorating musicians in Nazi concentration camps. On April 25, Joy Calico of the Blair School of Music, Vanderbilt University, will present a lecture, “Violins. Of Hope?”. 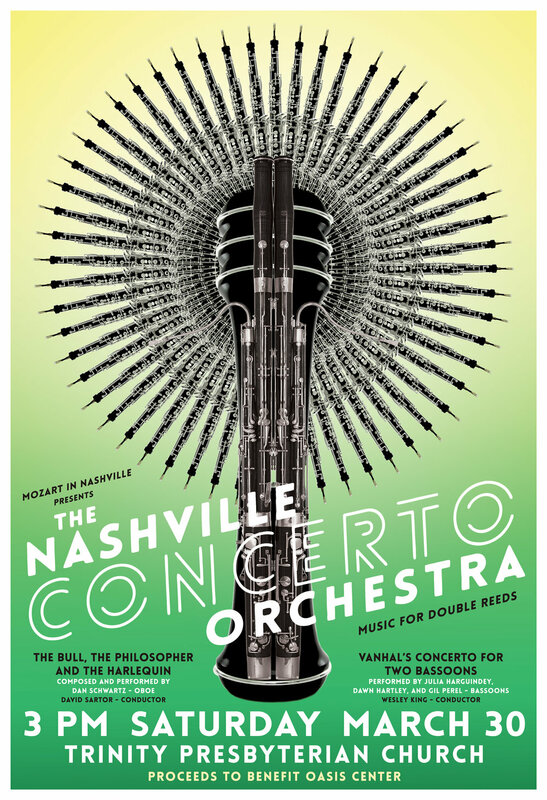 A concert on May 2, including Portara performing the Bach cantata “Feed the hungry with bread” (BWV 39) and the Nashville Concerto Orchestra playing Gorecki’s Symphony No. 3 “Songs of Sorrow”, will explore the power of music to respond to oppression, give hope, and spur action. Johann Sebastian Bach - Cantata 39 "Bring the Hungry their Bread"
Henryk Gorecki - "Symphony of Sorrowful Songs"
Mozart in Nashville is partnering with Violins of Hope to bring you this afternoon recital!